It’s nice not living in a basement anymore. Living on the river means we get quite a good angle of view. Here’s some stuff I can see. Not the four-stack one down the river but the two-chimney version that used to power the London Underground. In fact, Lots Road used to have four chimneys too but by the late 70’s it had been reduced to two. 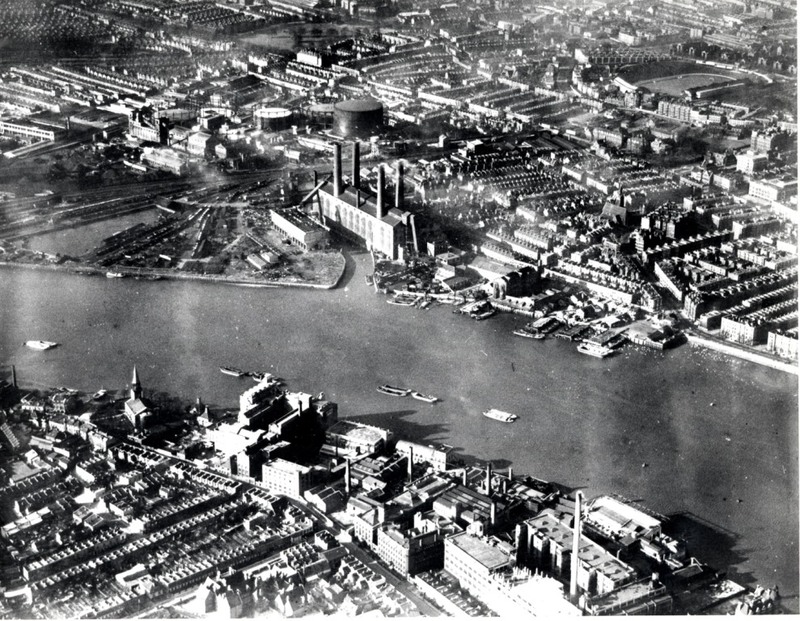 Built in 1905, twenty-four years before Battersea Power Station, it was claimed to be the largest power station ever built with a capacity of 50,000 kW. Just peeking over the tops of the buildings is the home ground of Chelsea Football Club. 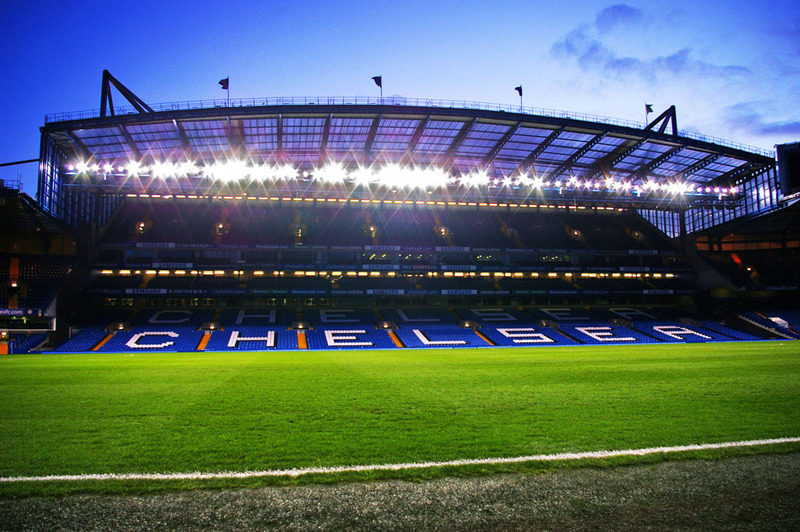 Opened in 1877 it was first used for athletics until Chelsea took over in 1905. Built in 1961, this building is occupied by the Metropolitan Police Service. A building called the Empress Hall used to stand on the site. 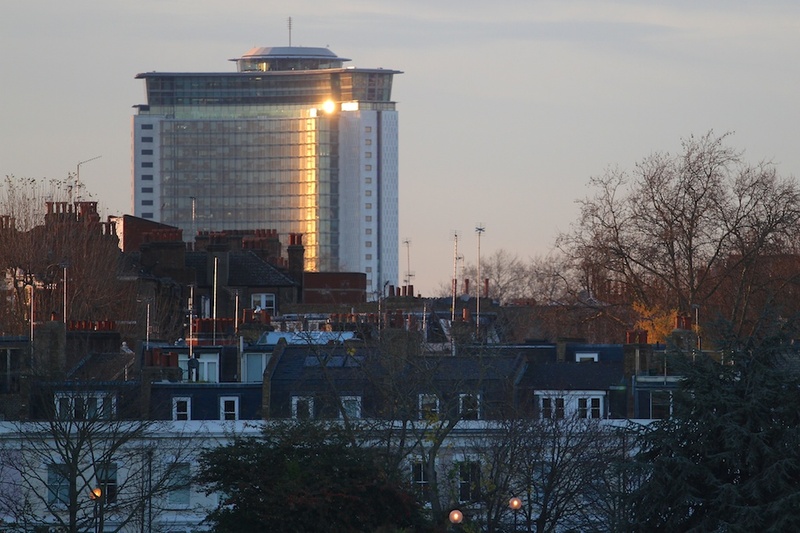 It has a private revolving bar at the top and in the evening it catches the setting sunlight on one of its three curved sides beautifully. 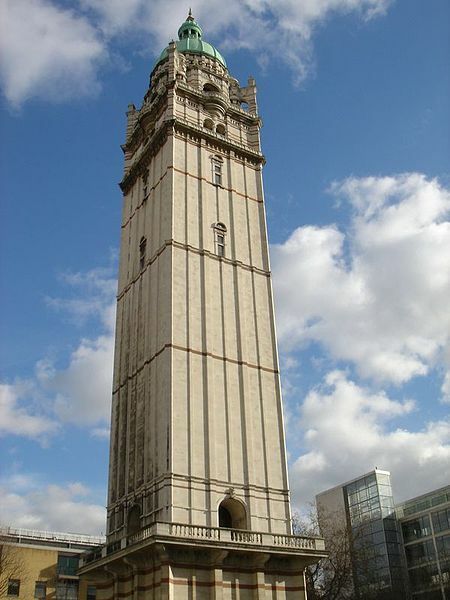 The 87 m tall Queen’s Tower is in the campus of Imperial College London at South Kensington. It is the sole remaining part of the Imperial Institute. 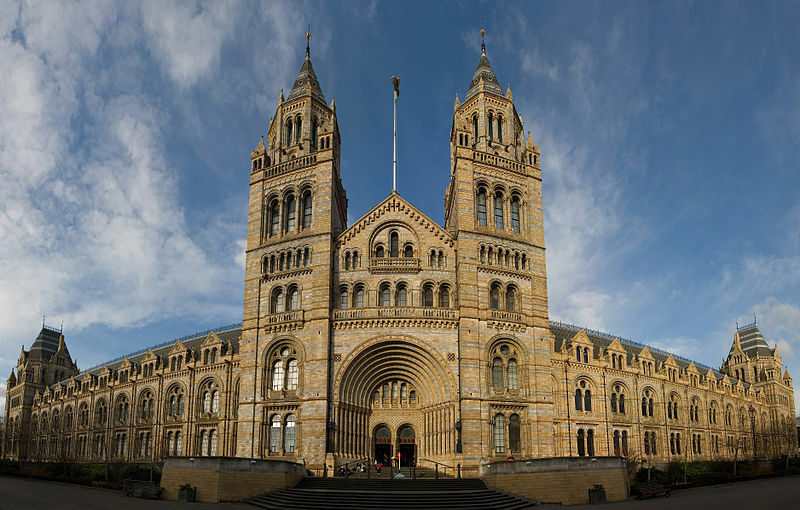 When the Imperial Institute was demolished, Victorian architecture was not fashionable and the tower was only saved by a campaign led by John Betjeman. The tower houses ten bells donated in 1892 by Mrs Elizabeth M. Millar of Melbourne, Australia. 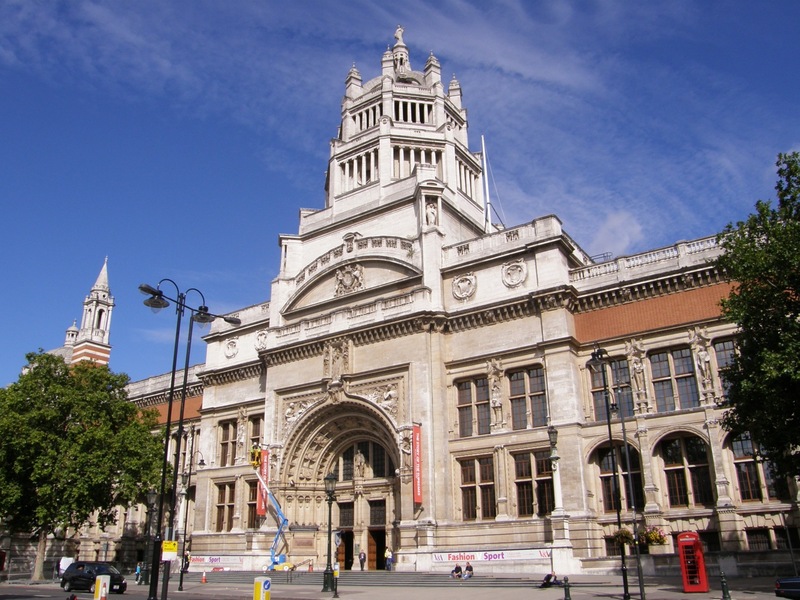 I love the architecture of this building by Alfred Waterhouse and I can just see the two towers that frame the entrance. This is a strange building. According to Wikipedia: Part of the building’s architectural features are from the Great Hall, which is the only surviving part of the mansion of Crosby Hall, Bishopsgate which was built in 1466 by the wool merchant John Crosby. 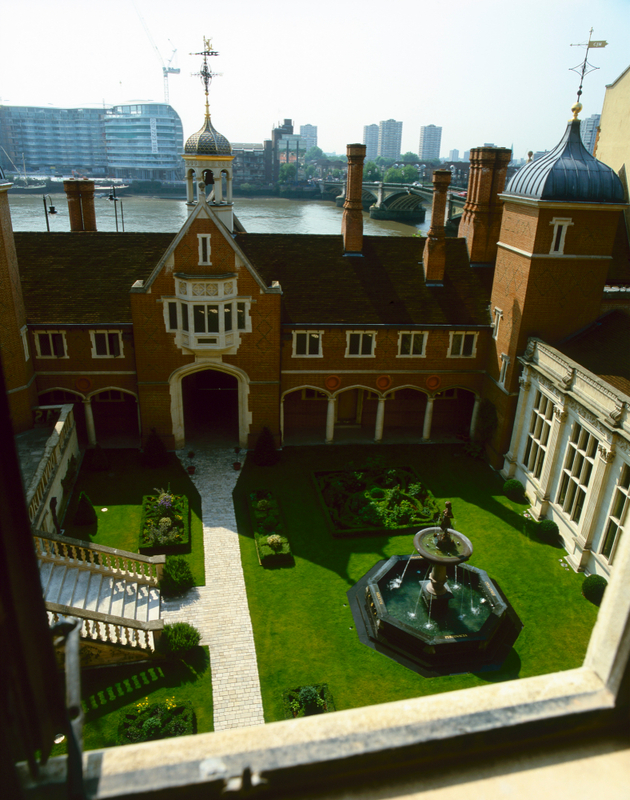 Crosby rented it to Richard Duke of Gloucester who used it as his London home. It was used as the setting for a scene in William Shakespeare’s Richard III. In the reign of Henry VIII it belonged to Antonio Bonvisi. Following a fire in 1672 only the Great Hall and Parlour wing of the mansion survived, it then became a Presbyterian Meeting House and then a warehouse with an inserted floor. In 1910 it was threatened with demolition and then moved brick by brick to its present site and the rest of the building by Walter Godfrey constructed around it. The move was paid for by the Bank of India who had purchased the Bishopsgate site to build offices. Godfrey also added the north wing in 1925-6 as a women’s university hall of residence. Not as flashy as Albert or Chelsea Bridge, Battersea Bridge used to be the last wooden bridge over the River Thames until the old bridge was demolished in 1885 and replaced by the current one designed by Sir Joseph Bazalgette. Despite it being the narrowest road bridge over the Thames, trams used to run over it until 1950 and due to it being on a bend in the river it is a hazard to navigation being subject to numerous collisions in its history. 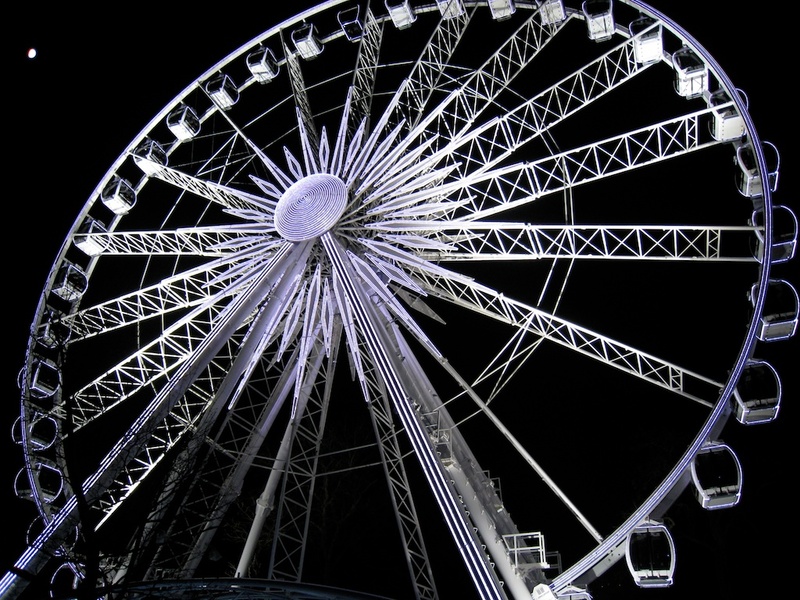 Being Christmas, I can also see the Giant Observation Wheel and the Power Tower in Hyde Park.